Monkeying Around has reached a new sales record with their newest dot to dot book, The Greatest Dot-to-Dot Adventure Book 1. After 30 days of being available to the public, the latest connect the dot book surpasses all other Greatest Dot-to-Dot books by almost 25%. Dot to dot puzzle publisher, Monkeying Around has seen a 24% increase in sales after the release of the Greatest Dot-to-Dot Adventure Book 1 in June. Based on internet and retail sales alone, the newest puzzle book has sold more copies than any of their previous Dot-to-Dot books. Created by David Kalvitis, The Greatest Dot-to-Dot Adventure features more story, more mystery and never before seen puzzles that have raised the stakes for all dot to dot books even higher. Sales for Adventure book 1 are expected to rise even higher when catalogues receive the book later this year. If sales continue as they did last year, the team at Monkeying Around will have sold over 3/4 of a million Greatest Dot-to-Dot books total. Never seen before in an activity book of this type, the 17th book in the Greatest Dot-to-Dot series contains an interactive storyline and secret clues that guides people through the puzzles eventually leading up to the largest foldout to date with over 2,600 dots. Images of what the young boy in the story sees “connects” as the missing pieces of a mysterious gift come together. The variety of images Kalvitis is known for creating in previous books continues to present themselves in imaginative ways. The newest book also boasts new puzzles styles and puzzles that give clues to other puzzles in order to solve them making it the more interactive and exciting than any puzzle ever before. Dot to dot puzzle creator, Monkeying Around, was founded in 2000 by David Kalvitis. Kalvitis is a lifelong puzzle and game fan, has a Fine Arts degree from Syracuse University and operated a graphic design business in Upstate NY for 13 years. Since 2000, Monkeying Around has been dedicated to offering innovative dot-to-dot products that will delight and entertain children and adults of all ages. Monkeying Around produces "The Greatest Dot-to-Dot Books in the World," a challenging collection of unique dot-to-dot surprises and variations. The company also publishes "The Greatest Newspaper Dot-to-Dot Puzzles," pocket and travel sized collections of weekly syndicated puzzles, in the pages of USA newspapers. 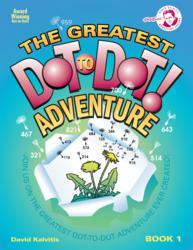 In 2007, the first of the "Greatest Dot-to-Dot Super Challenge” books was introduced.